A different heresy: Lent 1: God must be looking at the Rainbow! Lent 1: God must be looking at the Rainbow! God’s commitment to remember the promise God makes is an act of amazing trust and grace and as we enter this period of Lent I want you to think deeply on the consequences of God’s promise. Lent is a time for repentance and owning the faults of our humanity – not simply our personal faults but our collective ones. The story of Noah and the ark is one of the more disturbing and difficult ones of the scriptures. It is also a story found within many ancient cultures – the story of a great flood sent as a punishment on human beings for their waywardness. No children’s play set of Noah includes the multitudes of people and animals destroyed and floating dead in the waters surrounding the Ark – these images are too graphic and pointed because they speak to us of a God who seeks a new beginning and is willing to destroy lives to do so. Yet at the end of story God’s heart and mind is shifted to focus on opportunity and grace and whilst the narrative does not suggest it I do wonder whether part of this is the realisation of the horror that has unfolded. Yet my thought is that we do not need God’s intervention to wreak horrors on ourselves and it can only be God’s continuing to gaze at a rainbow that stays God’s hands. Think about life in our world at the moment and how God’s heart must despair at our inhumanity. God must be looking at the rainbow! At the beginning of this week 21 Coptic Christians were beheaded by members of the Islamic State. We have been following the story of the two young Australians who sought to smuggle drugs through Indonesia. So far 14 women have been killed in domestic violence incidents in Australia this year; that is two per week. Children are still being held in detention by the Australian government and our border policy demonises people who are fleeing terrible situations. Indigenous people are still disadvantaged in Australia and in many places around the world those who were colonised struggle to live. At an individual level people are self-interested and anxiety is rife. 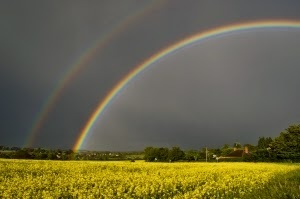 For me these continued tragedies of our humanity are signs that God sees the rainbow – God stays God’s hand. But as we travel through Lent God’s rainbow coloured viewing of the world – allowing us to go on in all our depravity - is match by God’s own commitment to change our suffering. We travel towards the cross where God rather than seek retribution shares the consequences of our depravity. In Jesus life and death God says that retribution and destruction are not the final answer. Jesus resurrection is the promise of new life. It is this fulfilment of the promise of the rainbow –God’s desire for the creation is a life and a future living in the peace and harmony that God desires for us. So this lent as God sees the rainbow and remembers his promises let us repent not just for ourselves but on behalf of all people everywhere. Let us throw ourselves on God’s mercy and be his people. Amen. We have already heard the good news of God’s promise to see the rainbow and remember and as God’s people in this time and place we have heard and believed that Jesus presence in the world is good news. His very baptism is a sharing in the lives that we lead so as to transform the suffering and horrors we experience into hope. We have taken our theme to be followers of this very same Jesus in the hope that as we follow temptations will be resisted and the kingdom of God will come close for the sake of the entire world. This is our response to the promise of God to be for us and with us and not against in the face of the great challenges of this time and of every time. So as God looks at the rainbow and remembers let us remember and be his followers. In the words of the Psalm today there were some phrases used by the Psalm which I believe can be helpful in our response to God’s presence and our commitment as followers. · I lift up my soul. · My God, in you I trust! · Make me to know your ways, O Lord; teach me your paths. · Lead me in your truth, and teach me. · For you I wait all day long. · Be mindful of your mercy, O Lord. · Do not remember the sins of my youth or my transgressions. · All the paths of the Lord are steadfast love and faithfulness. Each of you has the opportunity this Lent to commit yourself again to God, to turn back and journey towards God’s ways as a response of thanksgiving for what God has done. I would invite you now to choose one of these phrases and for the period of Lent make it your slogan, make it your mantra, make it your prayer. Let it shape your existence! After the service I will hand out a suggestion with each phrase as to how you might enter more deeply into the journey of Lent as you commit yourself again to God.